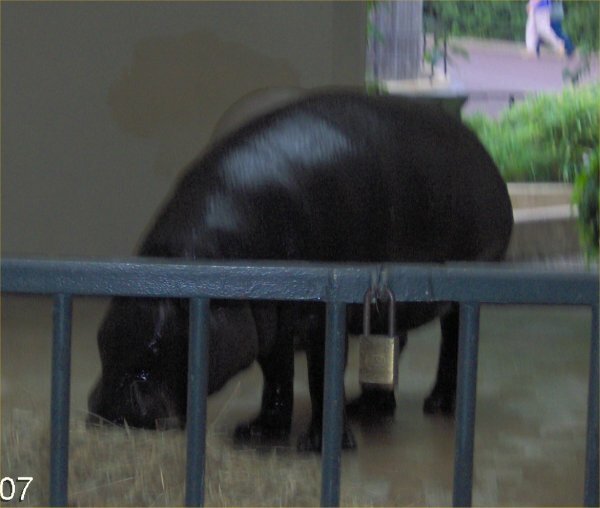 On 9/14/07, we went to the National Zoo in Washington, D.C. I took a lot of photos. 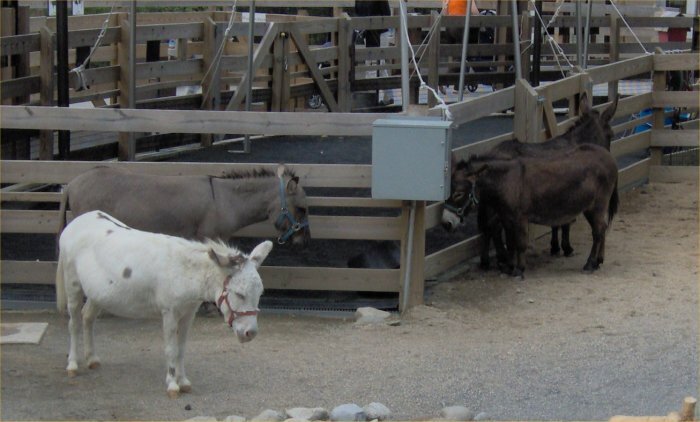 Here you can follow along with our trip and see the same animals that I saw. 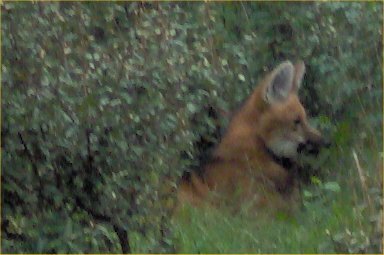 I normally only include photos of ponds and animals that are covered on my web site but, since I love all animals, I have included all the photos that turned out, 85 of about 120 that I took. 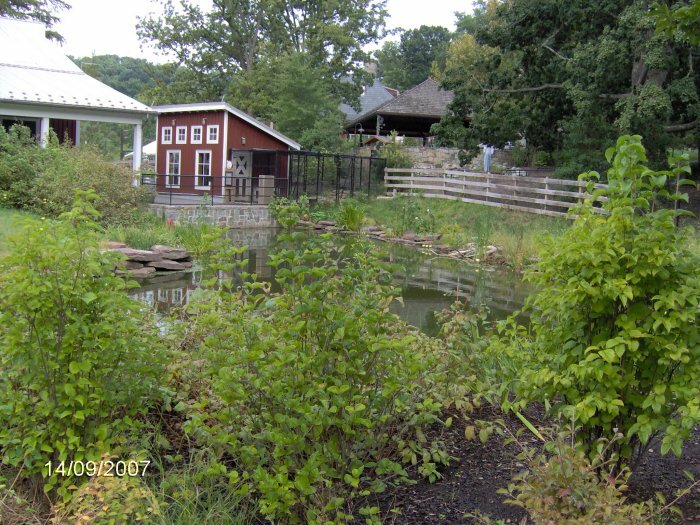 We started at the "Kid's Farm" which consisted of (that we saw) simply a pond, one cow, 4 donkeys, 4 goats, and a big fake pizza of all things. 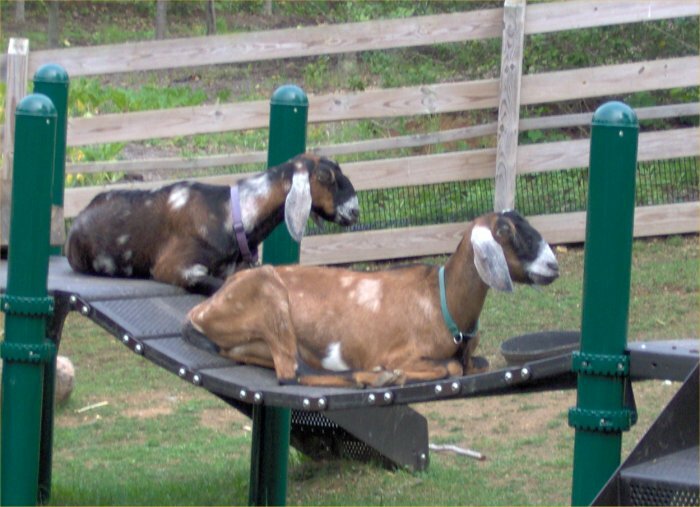 A view of the pond - from inside the "Kid's Farm"
Close up of two goats - these are Iris and Lucky who are Anglo-Nubian goats according to the zoo web site. 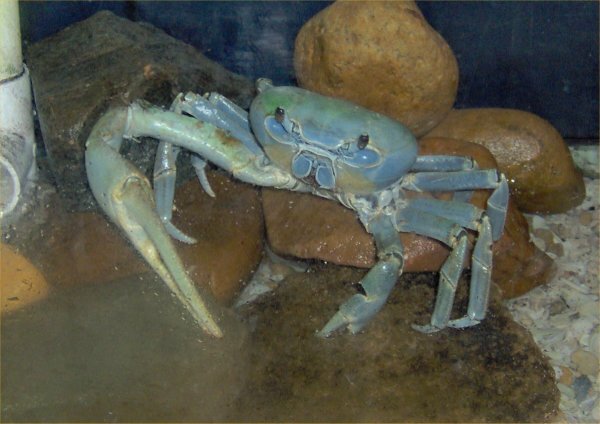 The site is done with frames so I cannot directly link to any page on a specific animal. 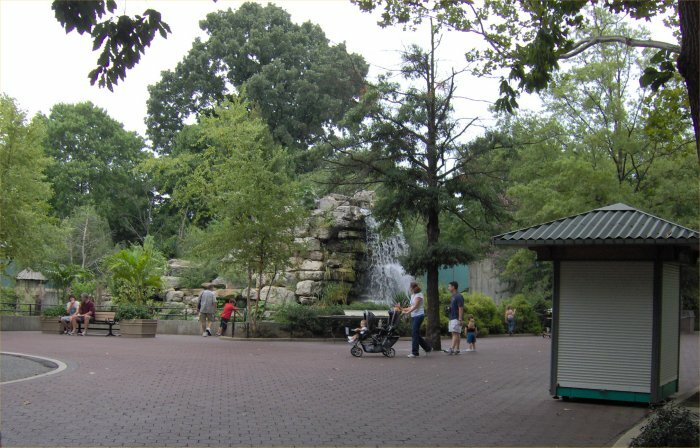 If you go to their main page, you can find information on most of the zoo animals. Next, we went to my favorite exhibit, Amazonia. 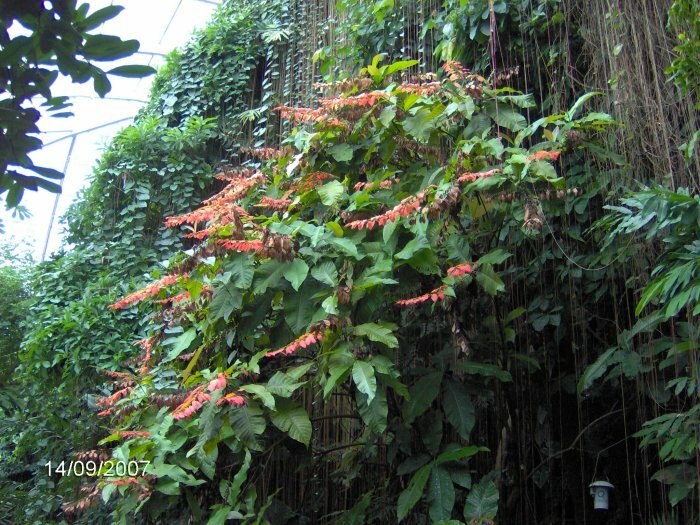 It is an indoor rain forest. 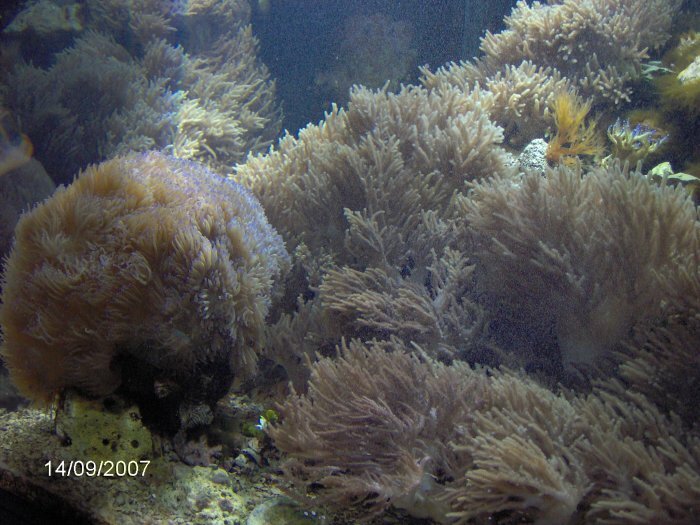 A number of large water areas contain large and gorgeous fish. 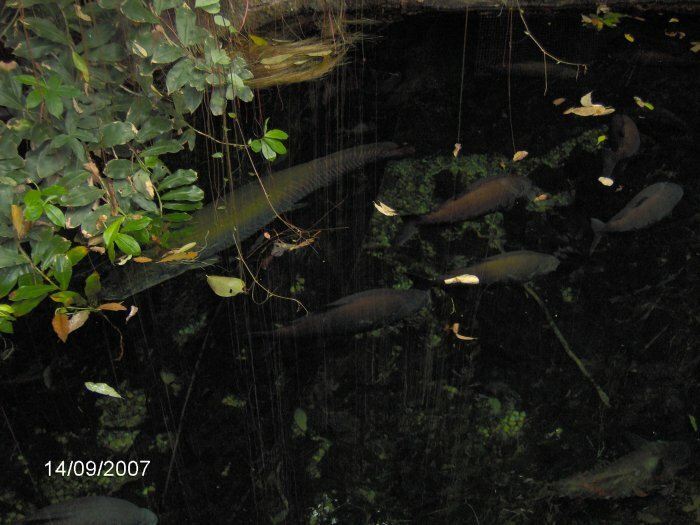 Amazon pool - taken from just above the water. 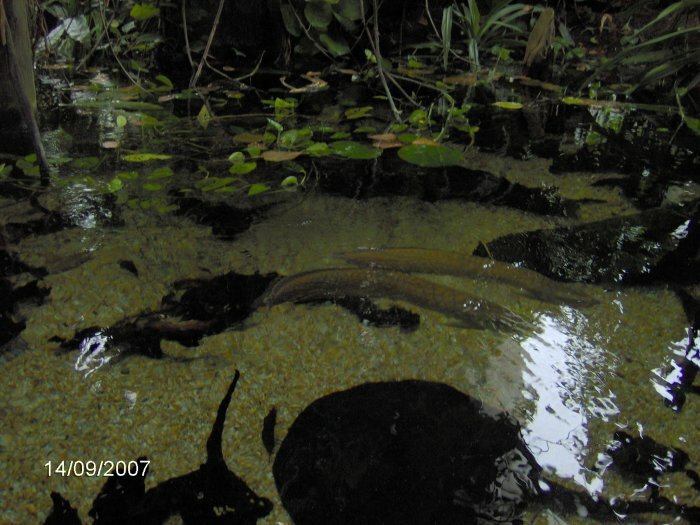 The two fish in the center are arrowana. There are sting rays at the bottom of the photo. 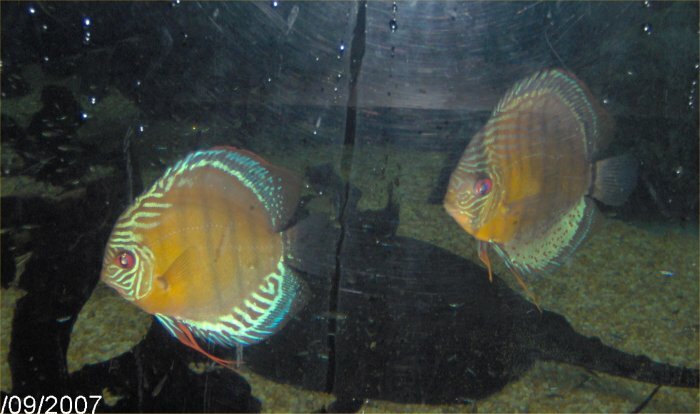 Two discus - taken through the plexiglass on the side of that tank. You can barely make out the tons of cardinal tetras and guppies that were in there. 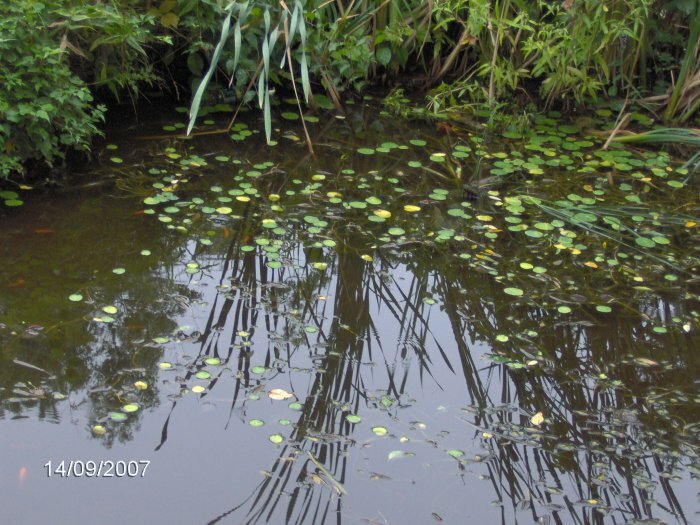 Guppies are not from the Amazon; I think they were to feed the larger fish. 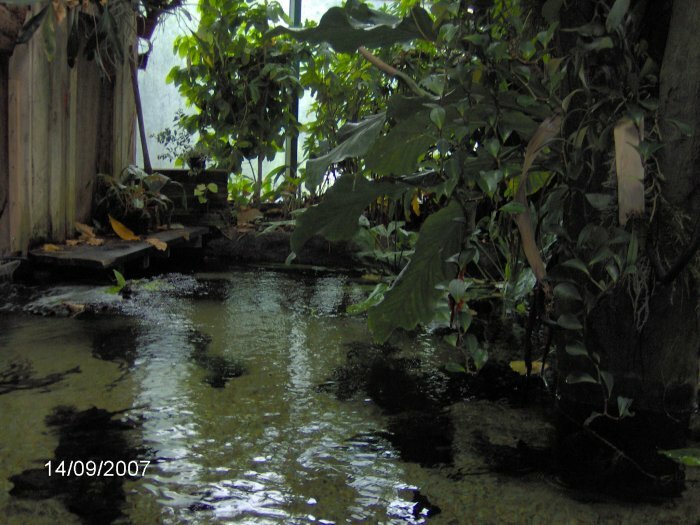 Amazon pool - taken from just above the water, a higher view showing plants. The big tank - by big, I mean the fish. 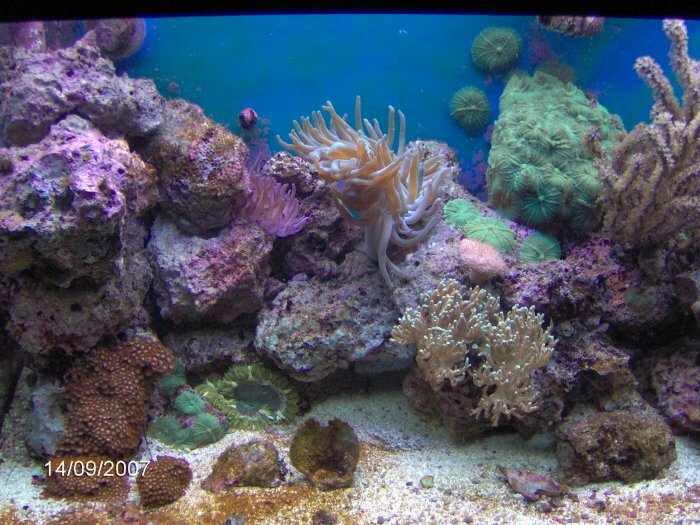 Of course, the tank too is 27,000 gallons. 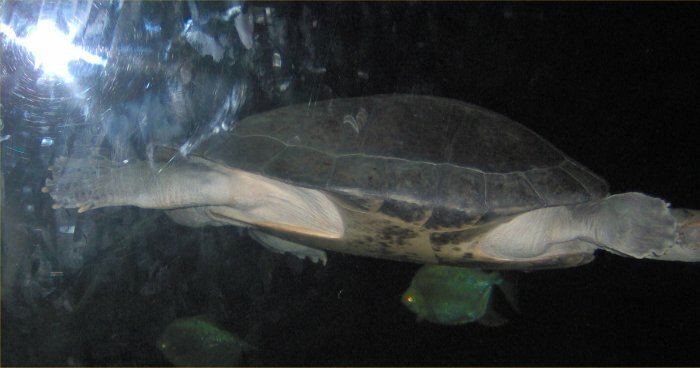 The tank contains arapaimas which are one of the largest freshwater fish in the world. 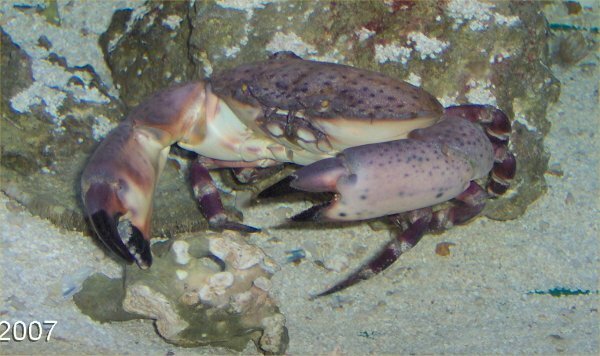 The web site has a live camera of this tank. The arapaimas are over 5 feet long. 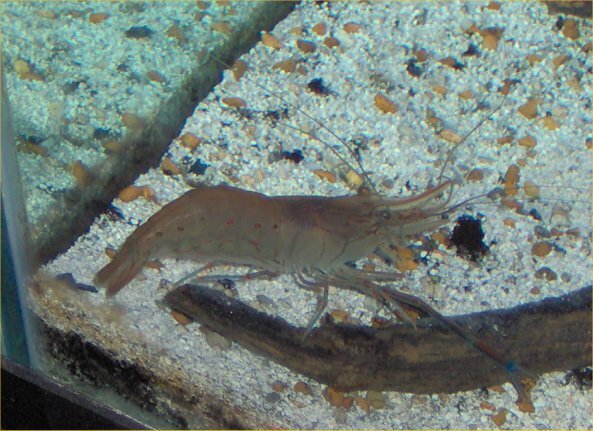 The tank also has huge redtailed catfish and pacus. It is too bad that people who buy those fish thinking they are small do not see them here first! Turtle - I did not write down or remember the name of this huge Amazon turtle. Amazon rainforest exhibit - note the two neat birds on the log. 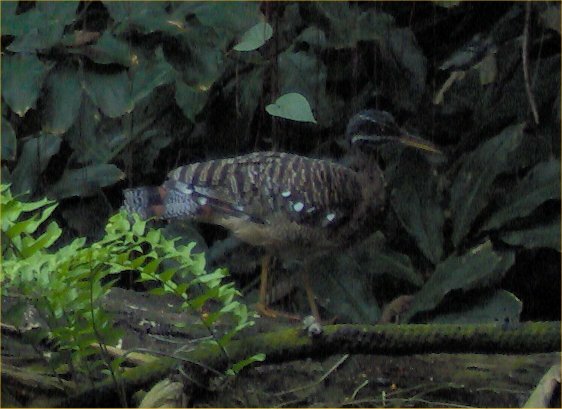 Close-up of those one of those neat birds - Sorry, I forgot to write down their name. 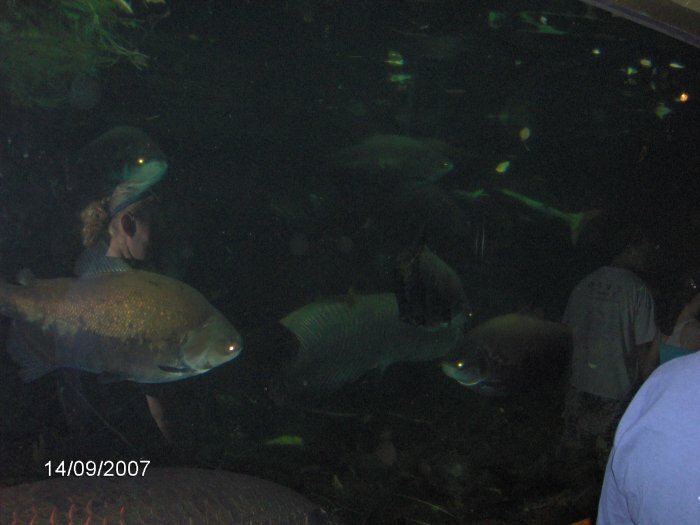 Top view of the big tank - the larger fish is a arapaima while the smaller ones are pacus. Top view of the Amazon pool - this is a top view of the pool we saw when we came in. You can see the stingrays. 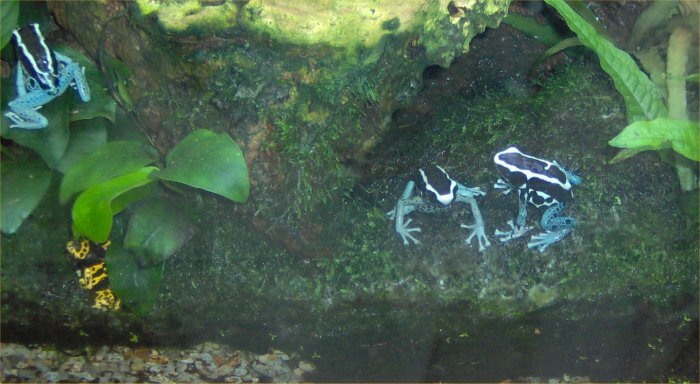 Amazon poison arrow frogs - three blue ones and one yellow one. I did not take too many photos as we walked further into the zoo, just this one before we went to lunch. 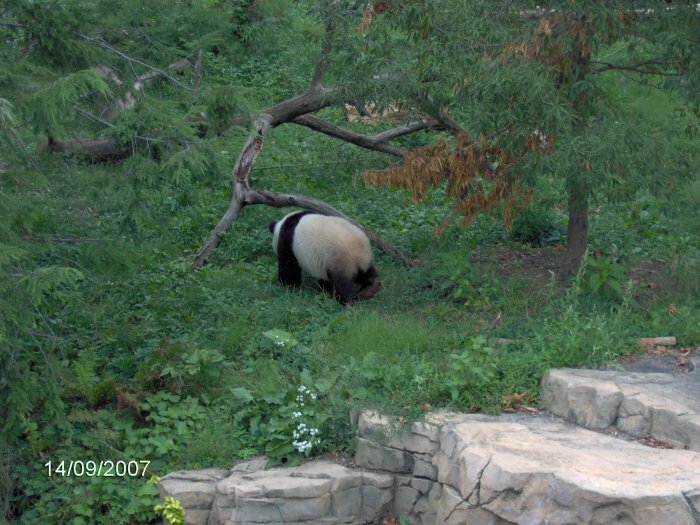 After lunch, we went to the best part, the panda bears. 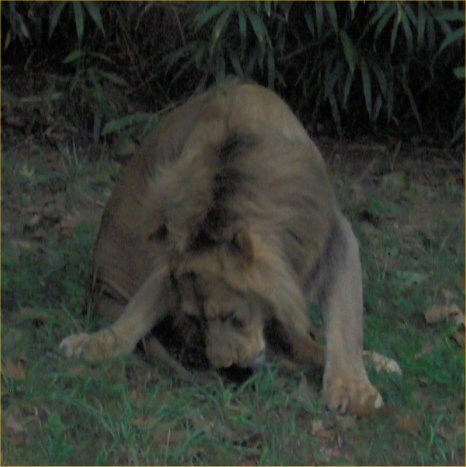 The two-year old baby is a male named Tai. 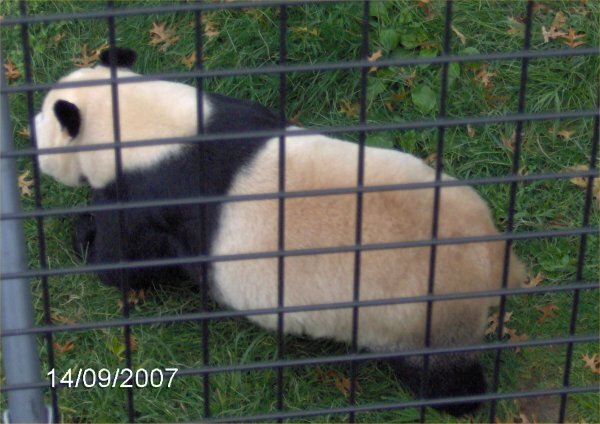 The mother is Mei and the father Tian. I never saw Tian or maybe I did. 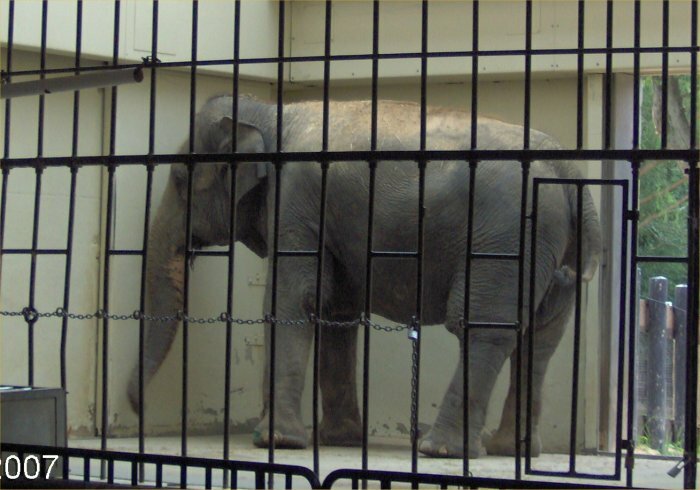 Some of the photos below said to be Mei may be Tian. I cannot tell them apart. 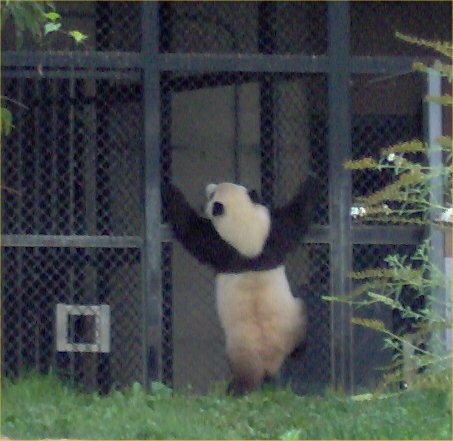 Tai trying to get inside. The trainer then gave him a treat stick. 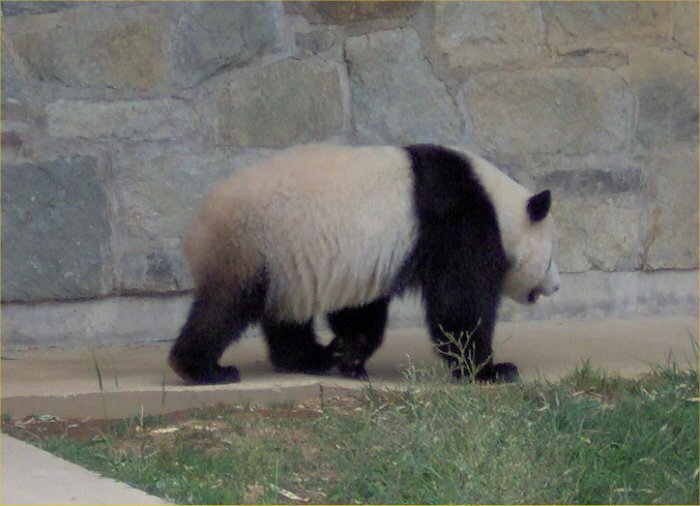 Mei walking around, rear view. The Asia trail was next. 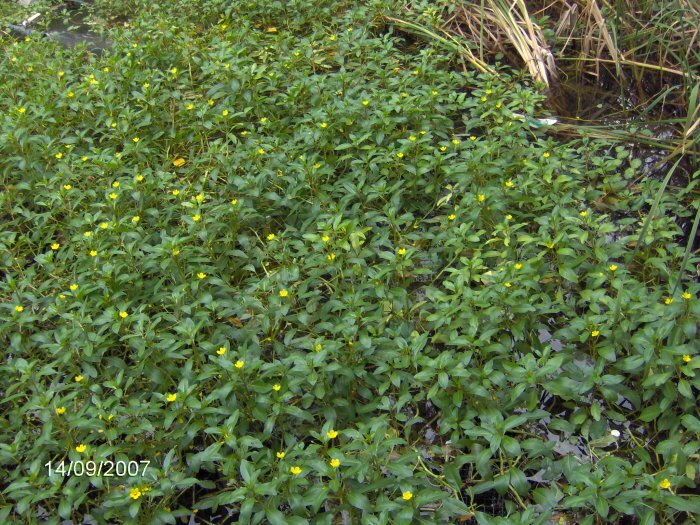 Flowering yellow primrose creeper - you know if I see a pond, I must take photos! 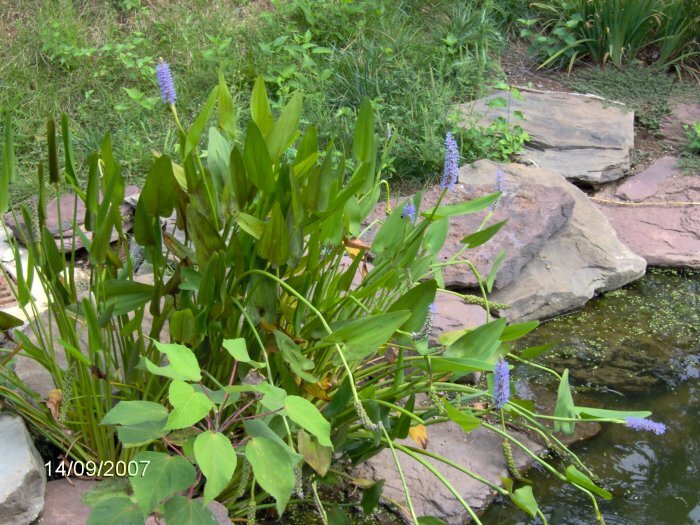 That pond - with yellow primrose creeper and common cattails. Then, it was on to the birds. 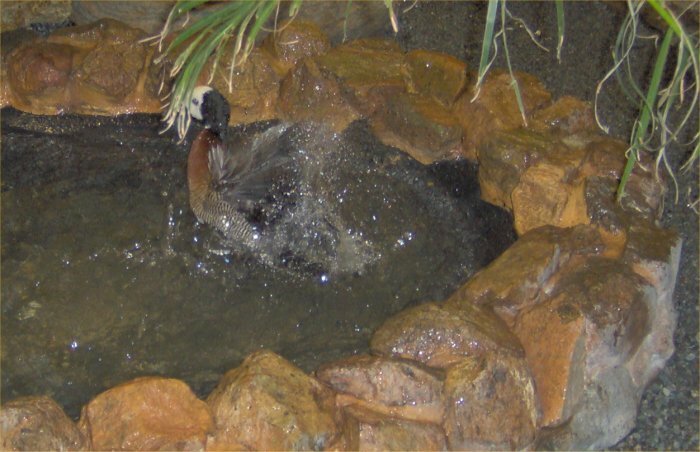 Duck bathing - this fancy duck (sorry, I did not write down the name) in the indoor exhibit was bathing. 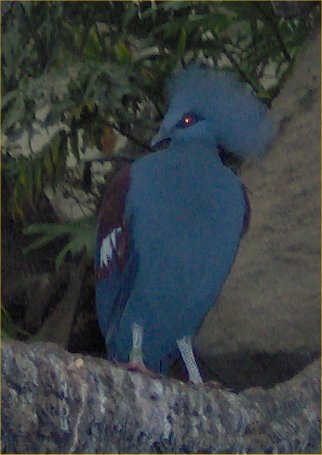 Western crowned pigeon - these birds were absolutely gorgeous. 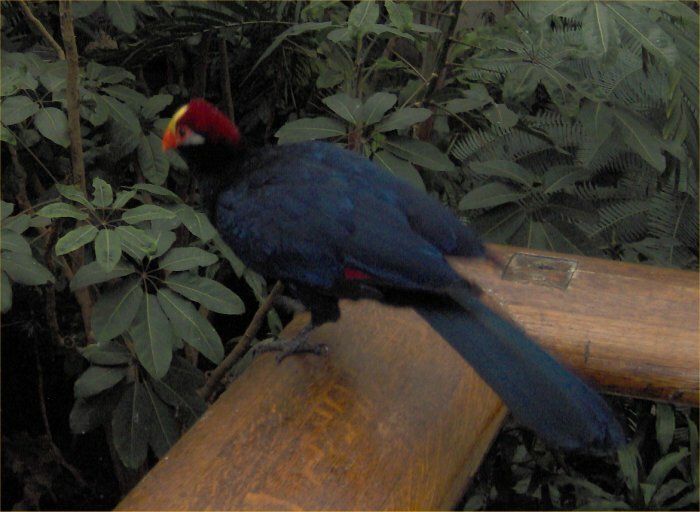 They were in the open indoor aviary so you could get as close as the birds allowed. 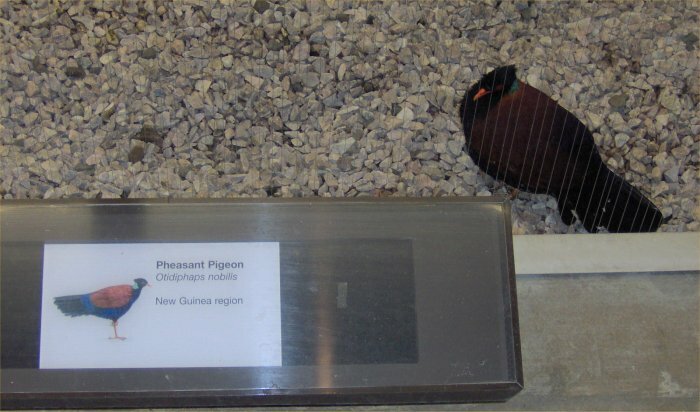 Pheasant pigeon - I know the name of this bird because he is posing next to his plaque! 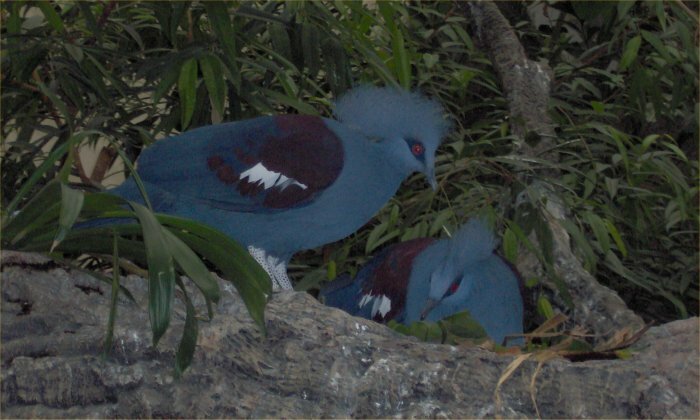 Pair of Western crowned pigeons - the presumed female on the right is on a nest although she was not down on it. 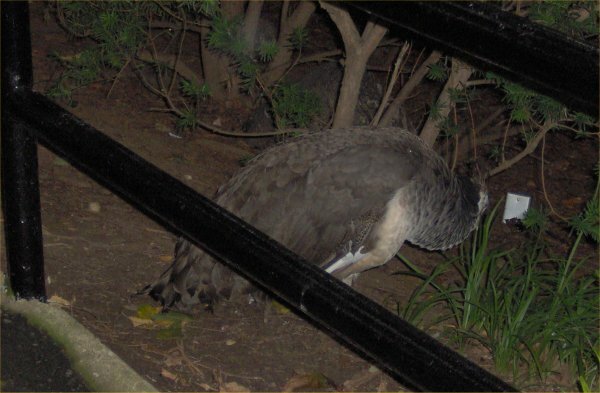 The male was watching over her. 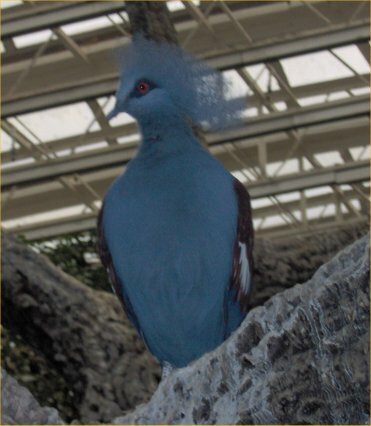 Beautiful bird - this guy is gorgeous. 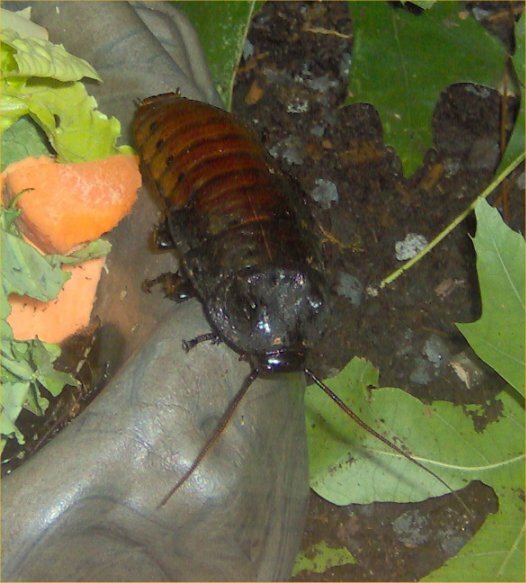 I forgot to write down the species name. 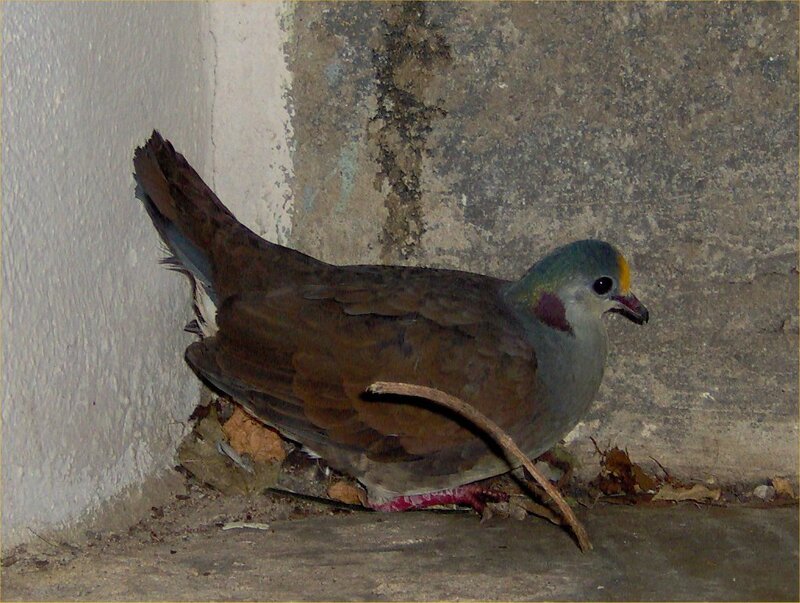 Dove? - I did not write down the name of this pretty little bird. 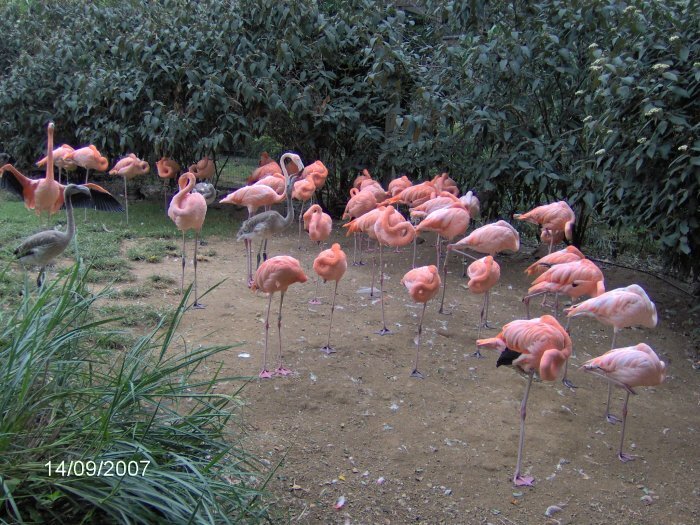 Flamingos - the adults are pink while the youngsters are brown/gray. 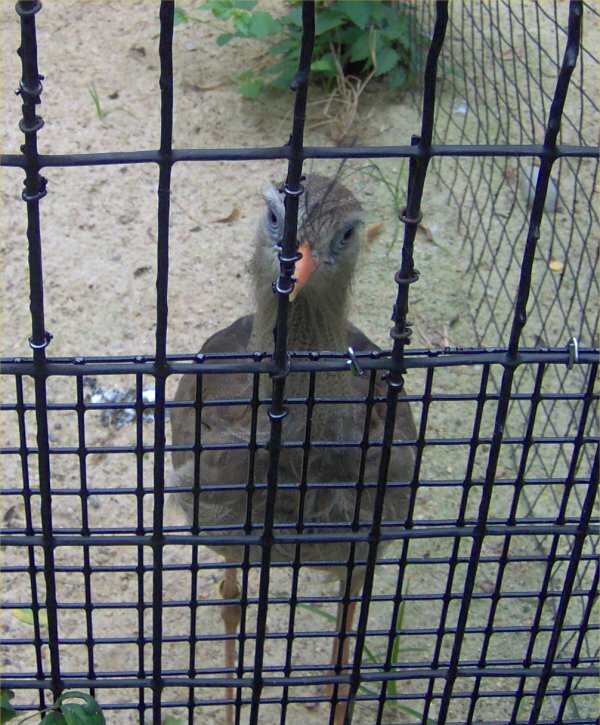 Red-legged seriema - I wrote down the name of this cute guy! He was up trying to get to us through the wire. 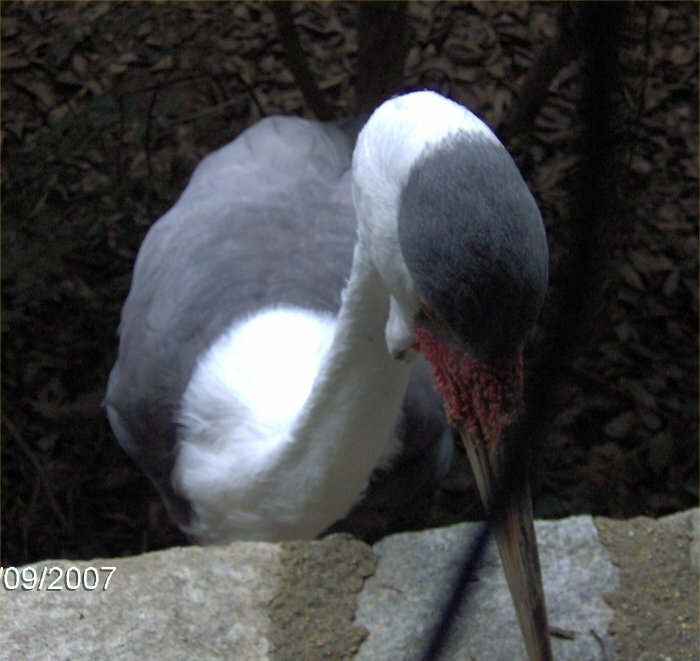 Red crane - sorry, I forgot to write down the actual name of this one too. 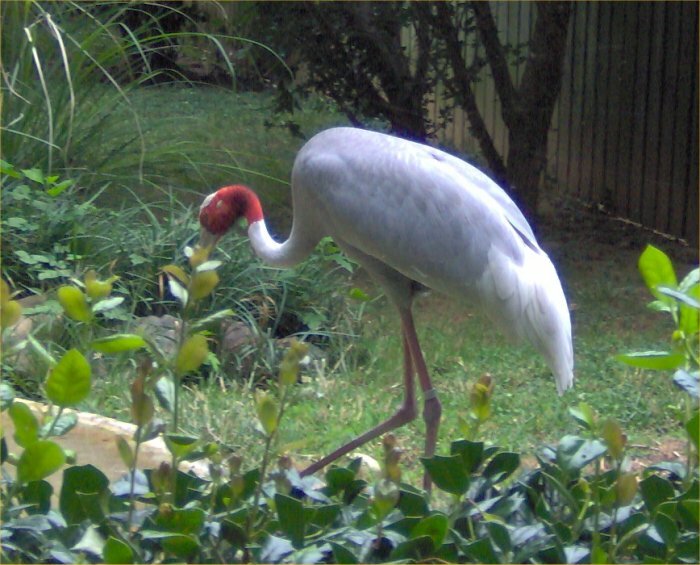 Wattled crane - this crane also came up to us. 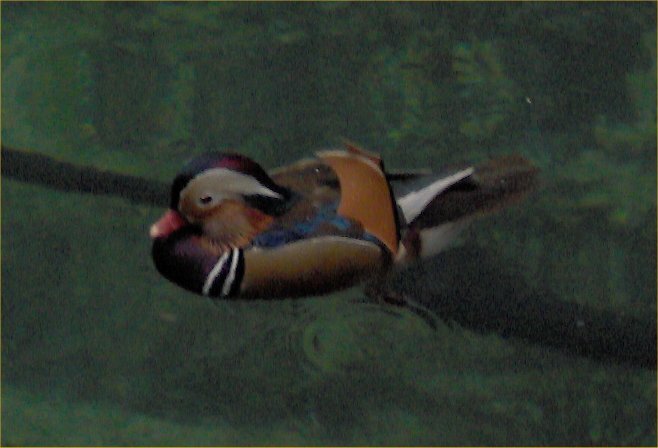 Male Mandarin duck - gorgeous! 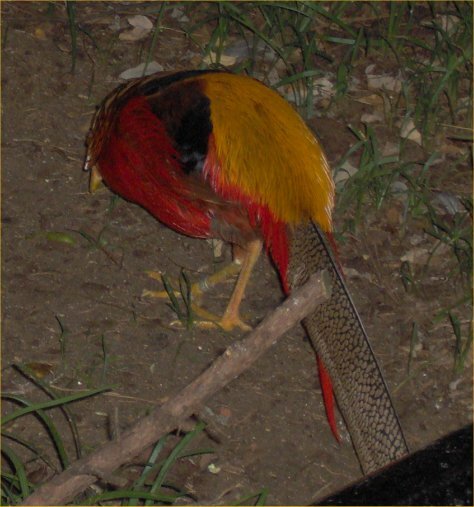 Male golden pheasant - gorgeous too except I photographed his rump! 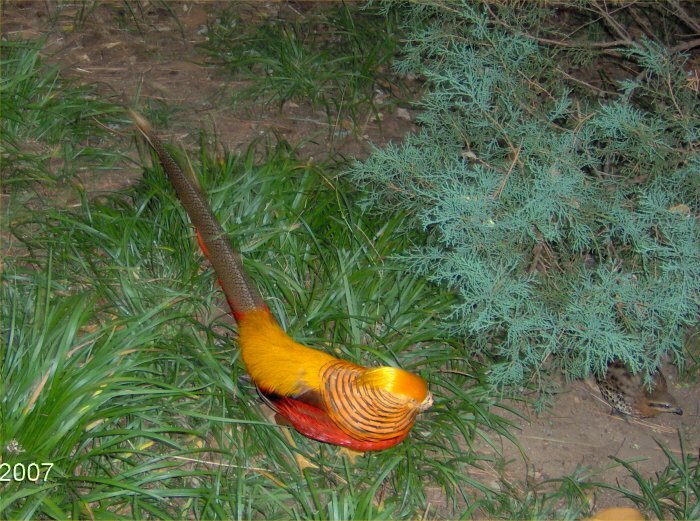 Pair of golden pheasants - this time I got his front side. Can you find the female? 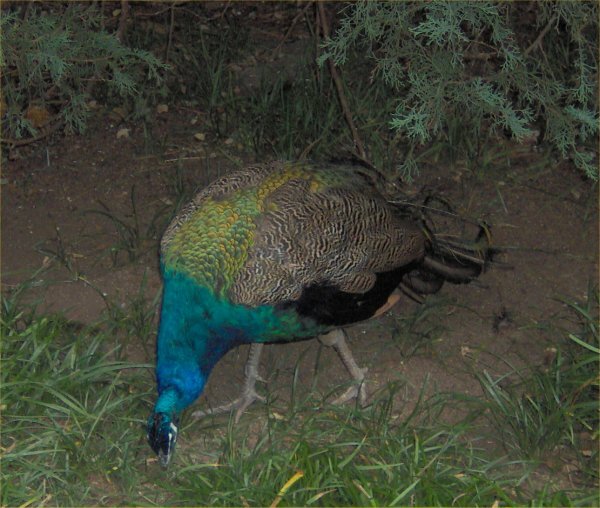 He was protecting the females from us and the peacocks. 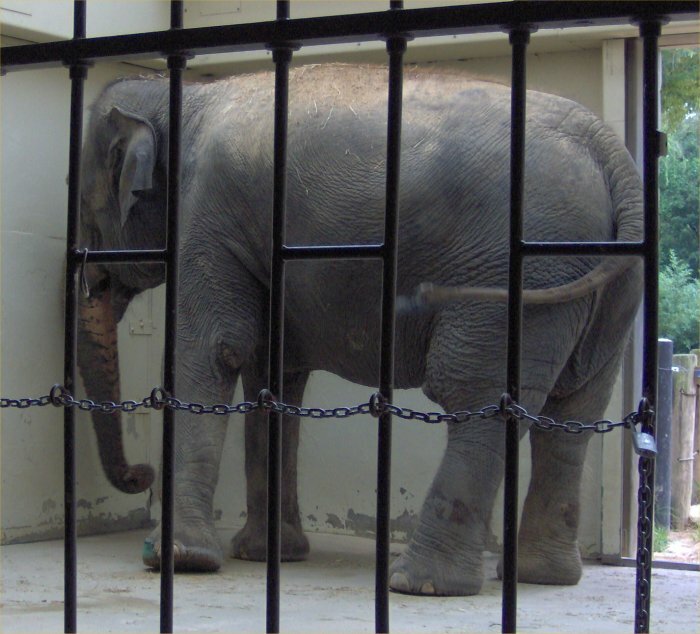 Over to this unnamed part of the zoo, we saw the following. 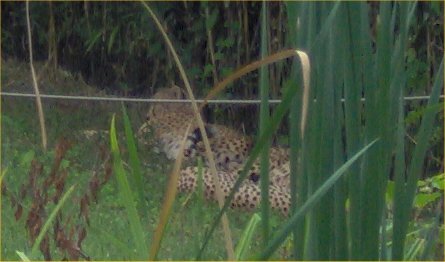 Cheetahs - sleeping and hiding. 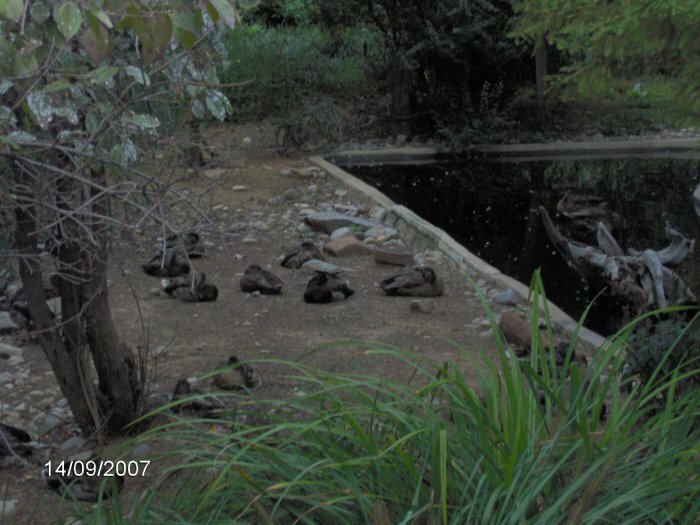 A pond in with the cheetahs. 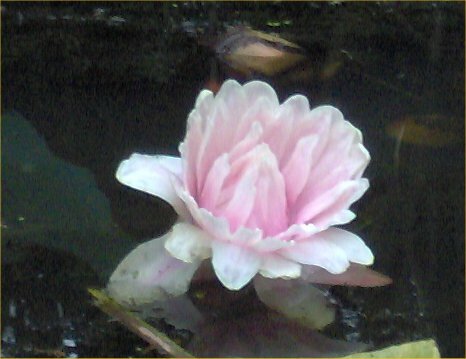 Note the small goldfish and possible floating heart. 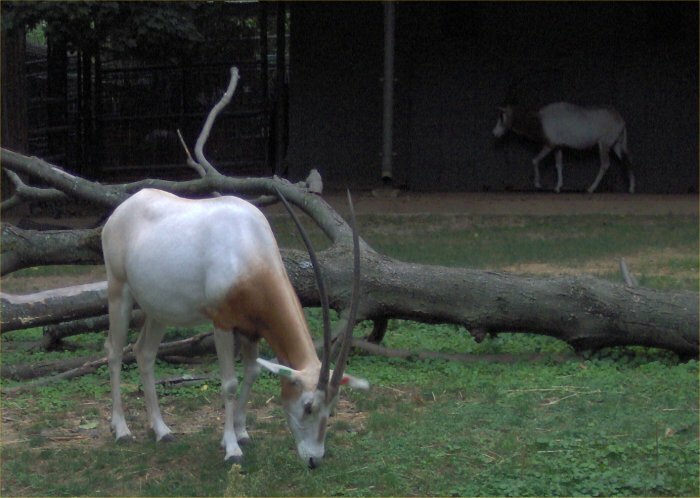 Two scimitar-horned oryx - I wrote that name down! These are gorgeous animals. 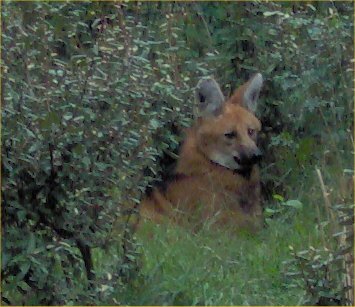 Maned wolf - hiding in the grass. We got to see him run before sitting down with his mate. We passed back past the panda bears. 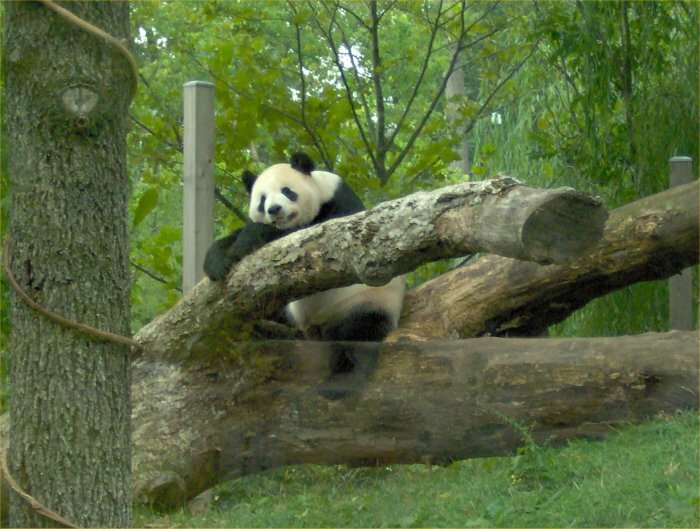 Mei - a not-so-flattering view through the wire. 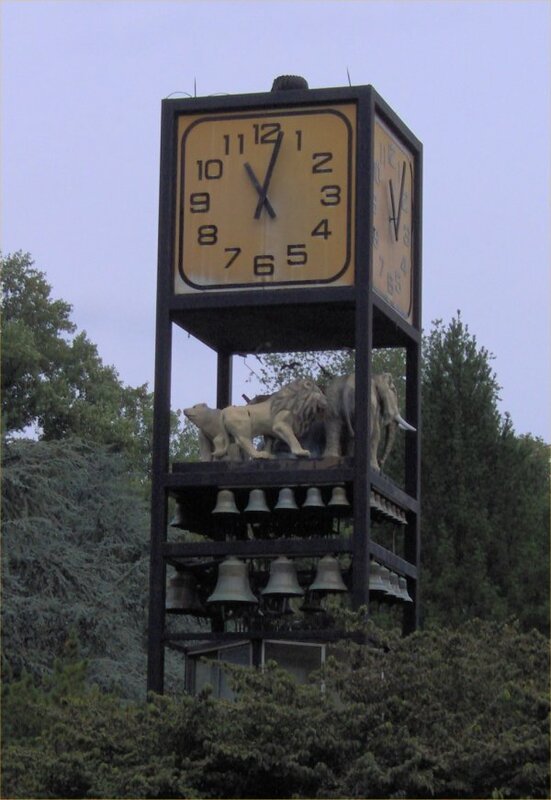 Then, it was on to the elephant house. Male capybara - the largest rodents in the world. 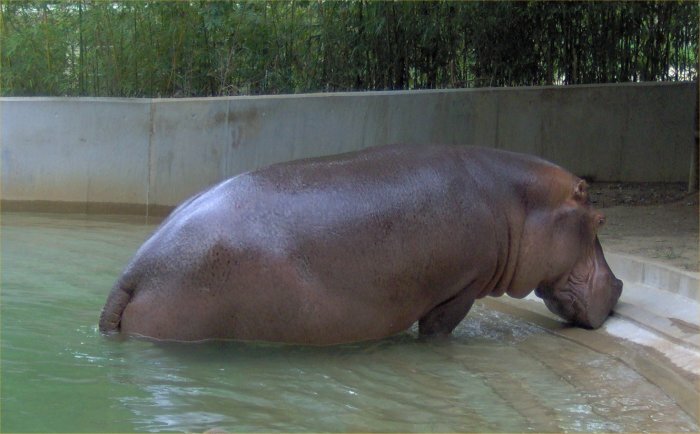 Male Nile hippopatamus - he was huge! 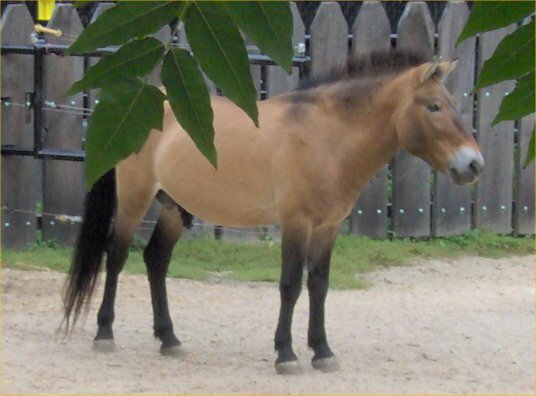 Przewalski's horse - Mongolian horse, extinct in the wild. 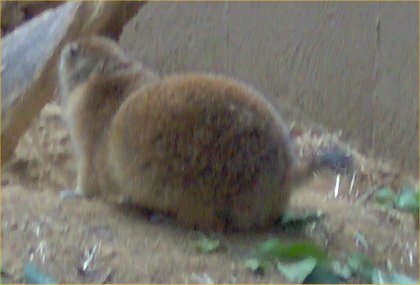 The small mammal house had a number of interesting animals but they were mostly behind glass or plexiglass so photos would flash back (without the flash, it is too dark). I did not take many photos in there but a few turned out. 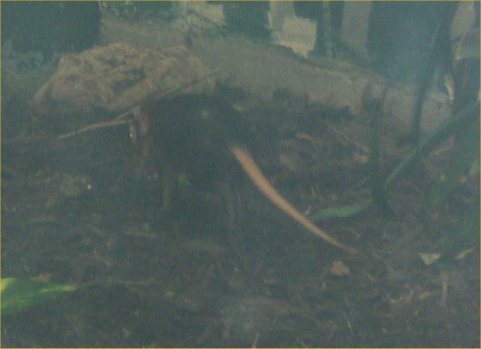 Giant elephant shrew - these guys were really interesting. 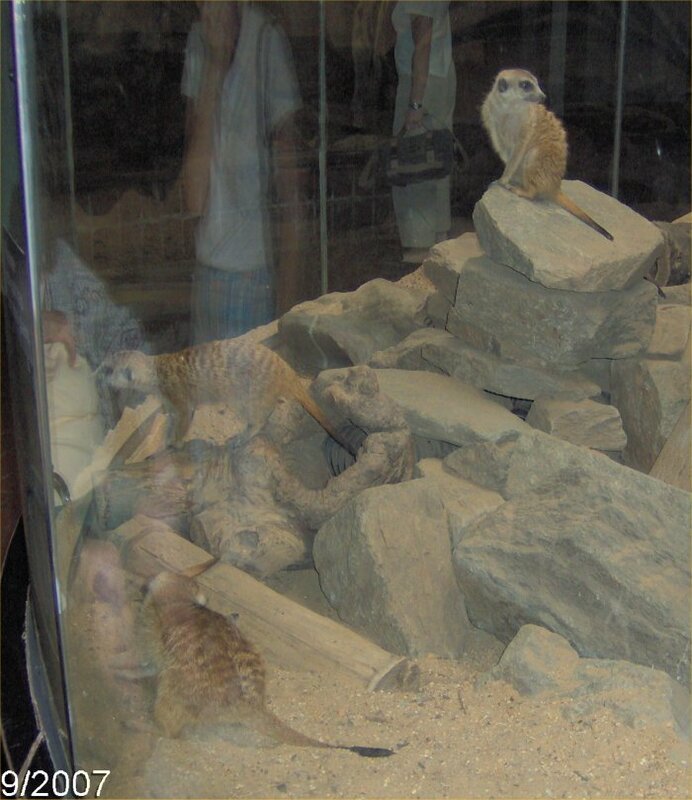 They were in two separate cages and were very active running all around and right up to the glass. 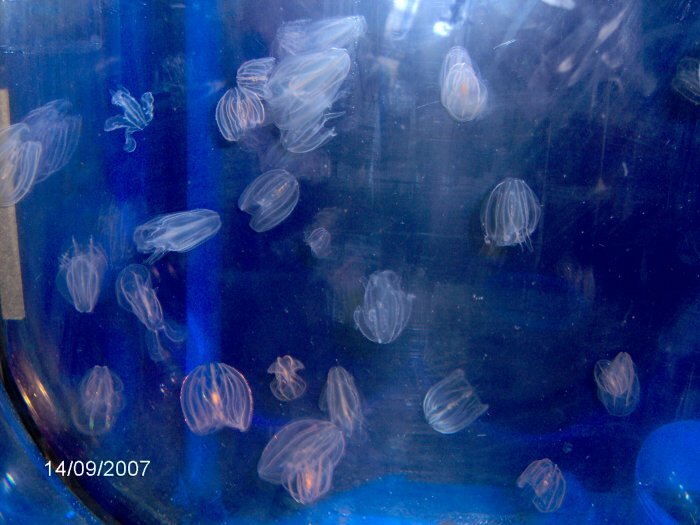 They were the size of rats with rat tails but really long noses and long legs. Meerkats - you have got to love these guys. They were playing like kittens. Three are in this photo. 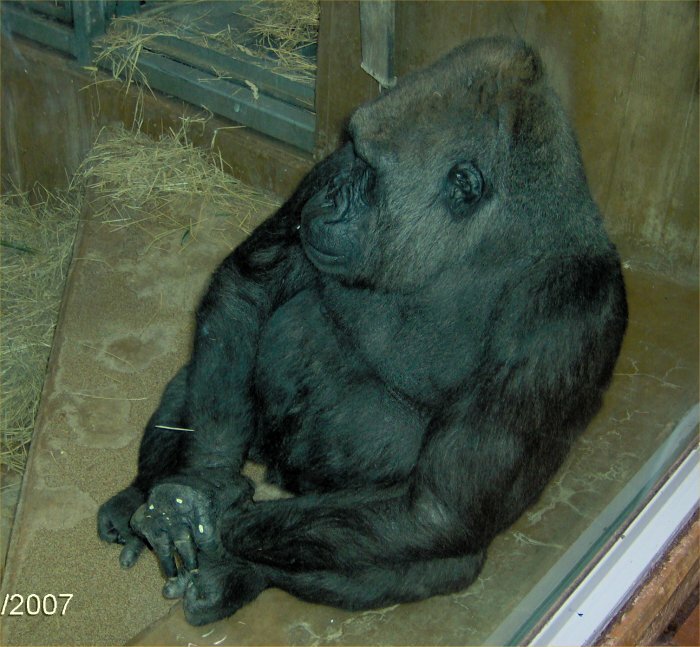 My brother's favorite place to go was the Great Ape house so he could visit some relatives. 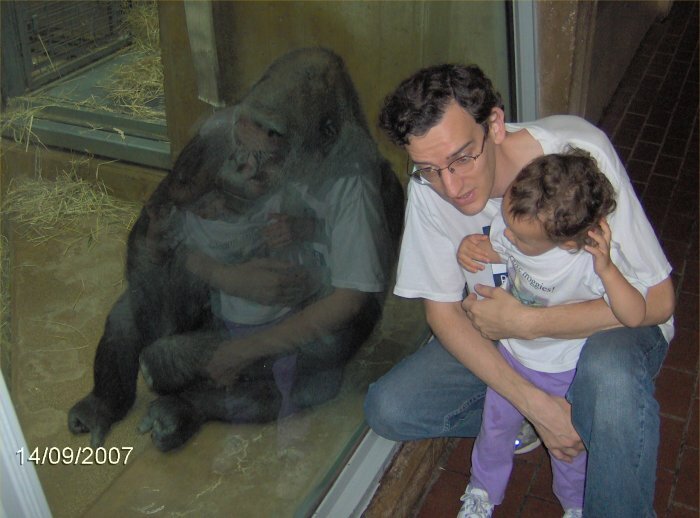 Gorilla - next to my gorilla brother and his daughter who was saying, "No, no." 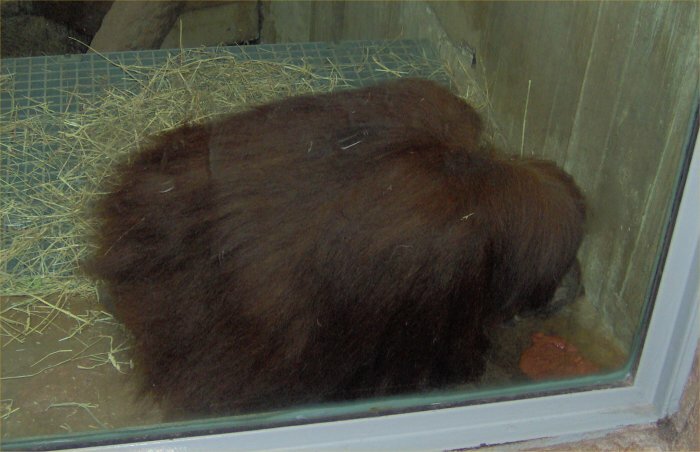 Orangutan - this female was throwing up her food, eating it, and throwing up again. The volunteer there said they do that a lot simply because they can. I was waiting on my family so I was standing there for a while (not watching the orangutans too much, eww) but it was funny. Every time a new person came by and saw the vomiting, they would say "eww" and snap back. 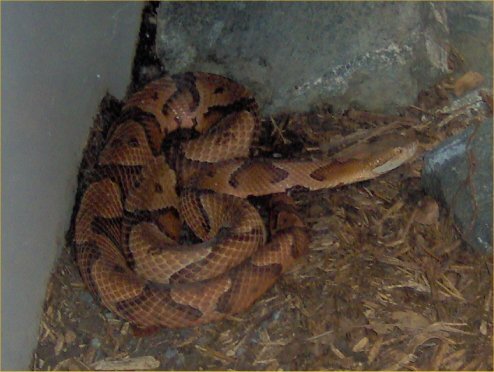 There are always plenty of photo opportunities at the reptile house despite the flash reflecting often. It is too bad I was getting too tired at this point to much care. 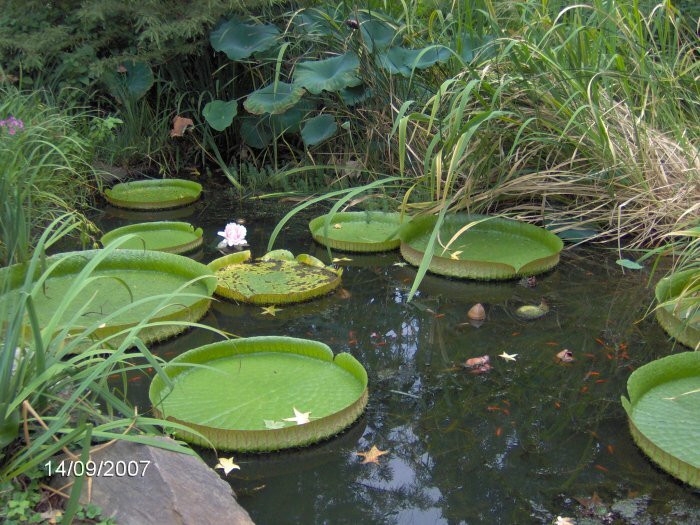 Across from the reptile house was a lovely pond with Victoria lilies. I got carried away with photos at the invertebrate house! I also failed to write down the names of most of the animals. 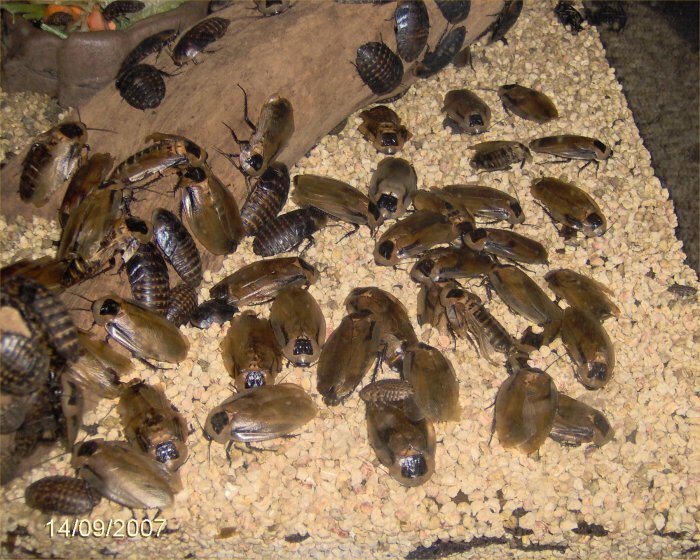 A colony of roaches - forgot to write down the name but it was not one I have had before. The final major stop was the big cats. 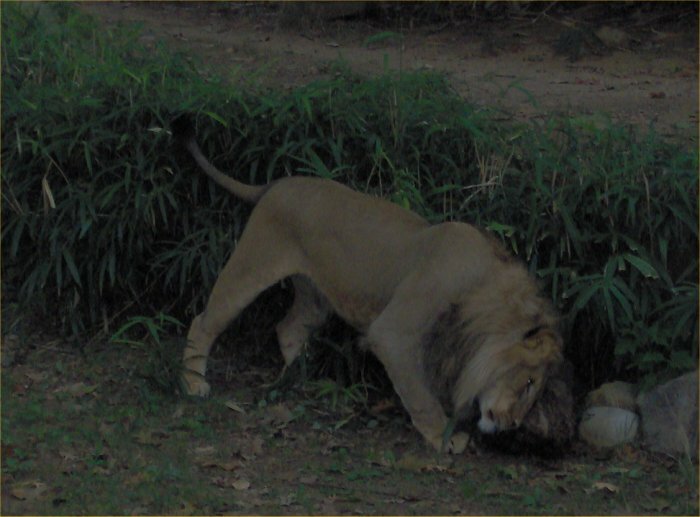 Male lion - rubbing his face on a rock. Two tigers - they were way in the distance; this is a zoomed in version of them. On our way out, there was lemur island. I failed to find any lemurs but it has a huge waterfall and a lot of turtles. Waterfall up close. I so wanted to get under there! 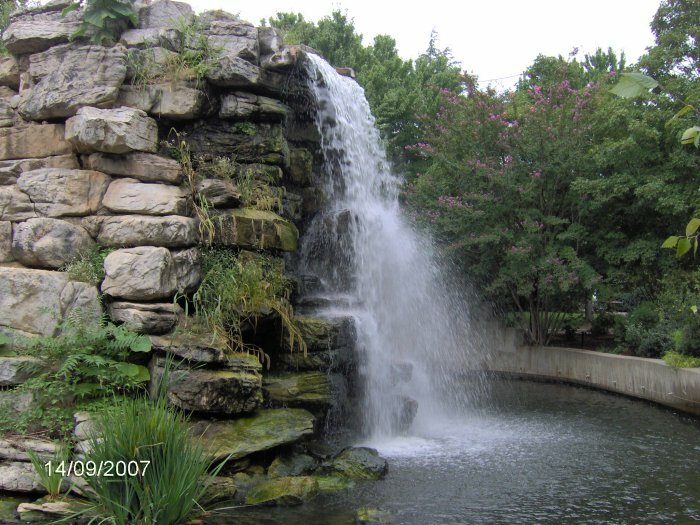 I also wanted a big waterfall at home. 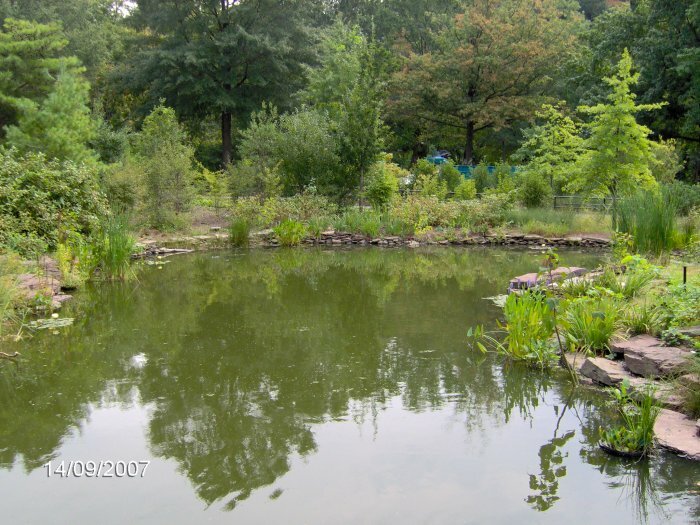 Pond - this is the pond around lemur island. 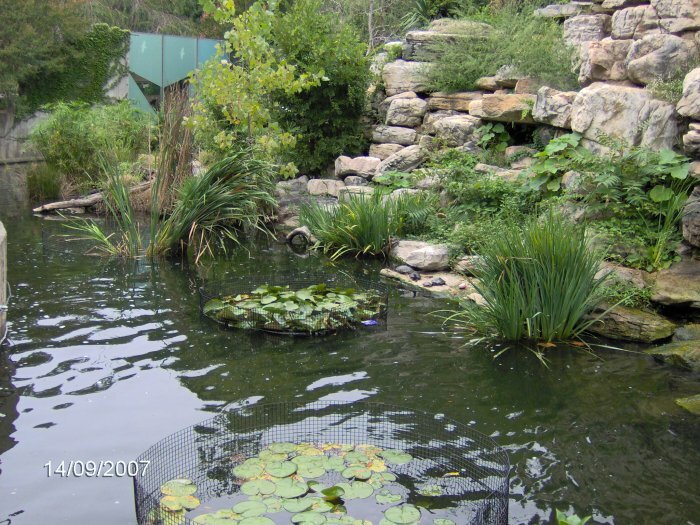 You can see water lilies in cages to keep the turtles off and some turtles basking in the distance. 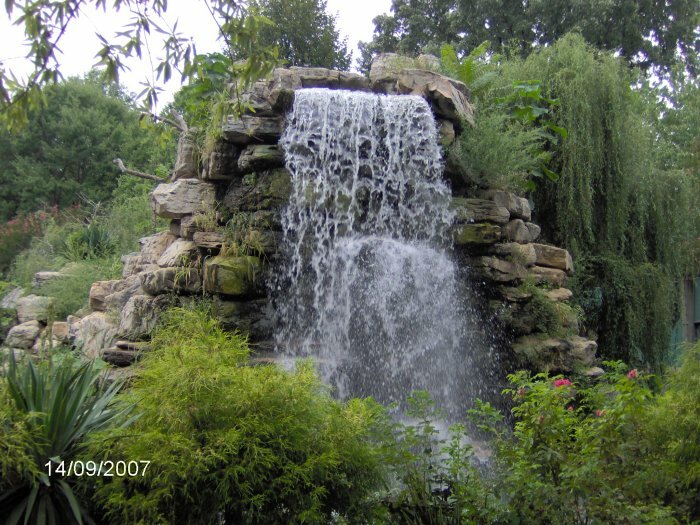 Big waterfall - view from the side. Four turtles - close-up. 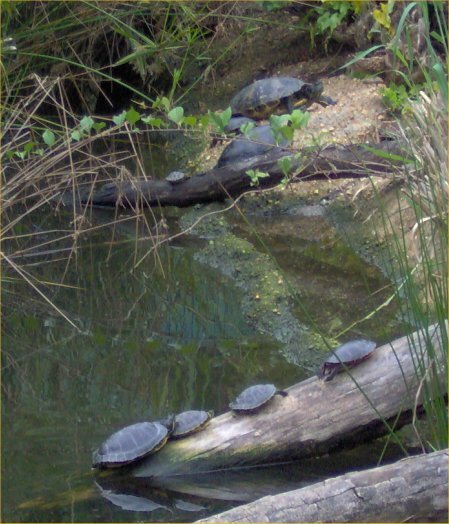 I think they are Eastern painted turtles. 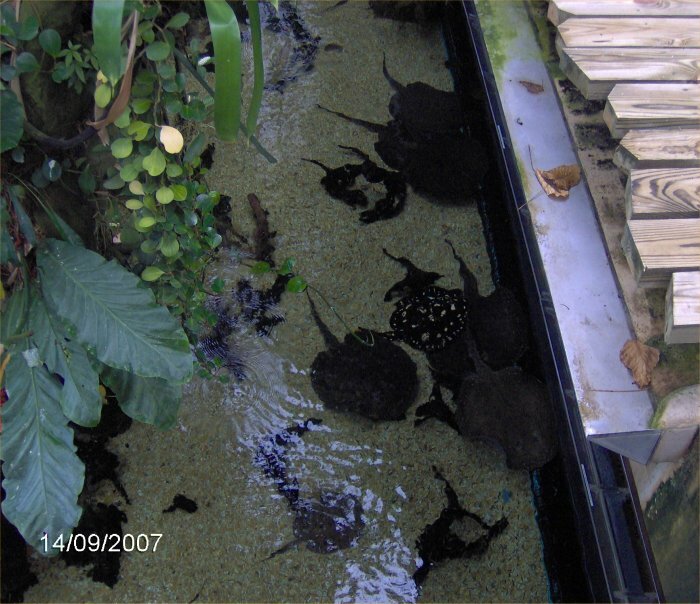 Eight turtles from a distance. Farthest away is a huge turtle! 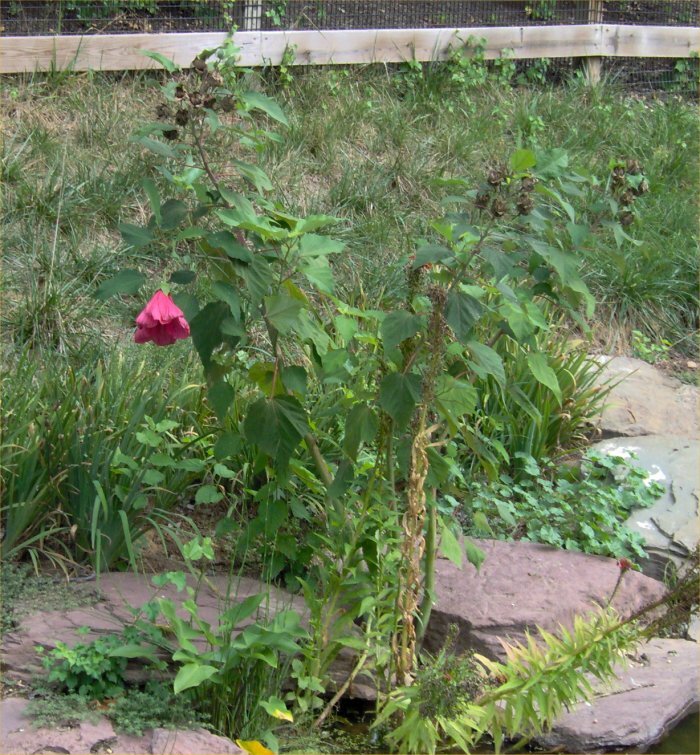 Near them is a itty bitty turtle too. I found a few more animals while waiting for family to play catch up. 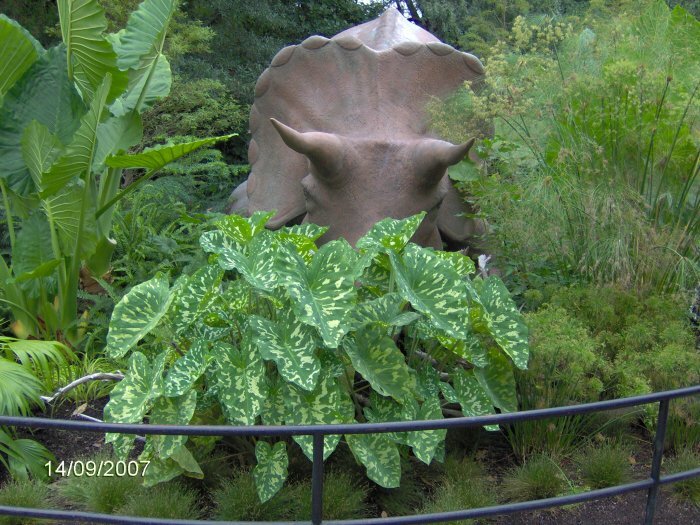 Fake stegasaurus - I took the photo to show the variegated taro. It is huge! I just bought some a few weeks ago, and it is nothing in comparison. 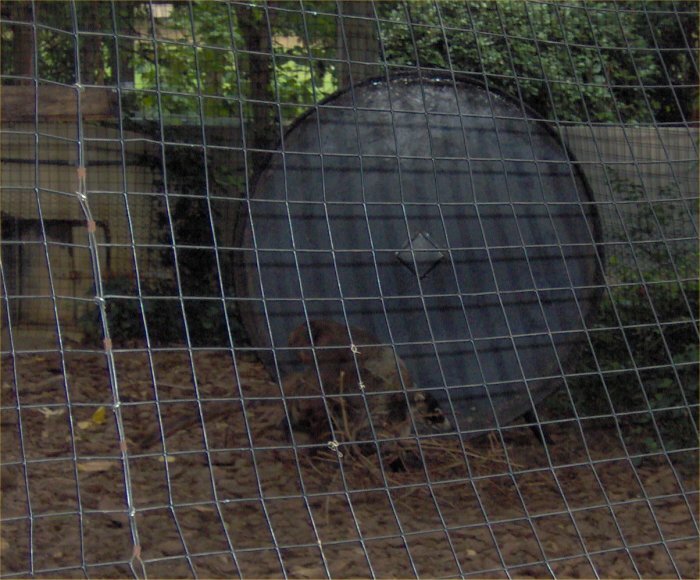 Coatimundi running on a huge exercise wheel. There are two of them. 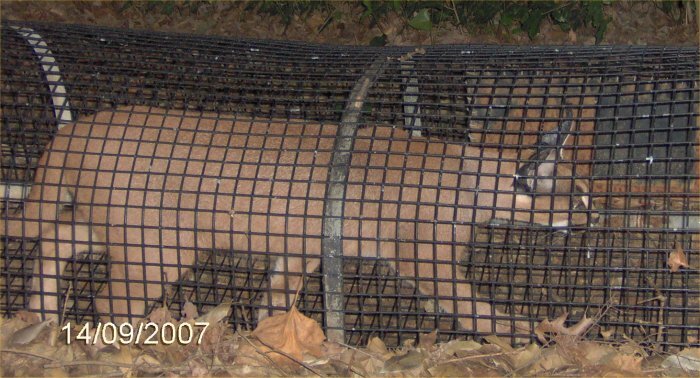 Caracal - this African cat was pacing at the end of a tunnel that linked his cage to that of another caracal. I hope you enjoyed your tour of the zoo through me. 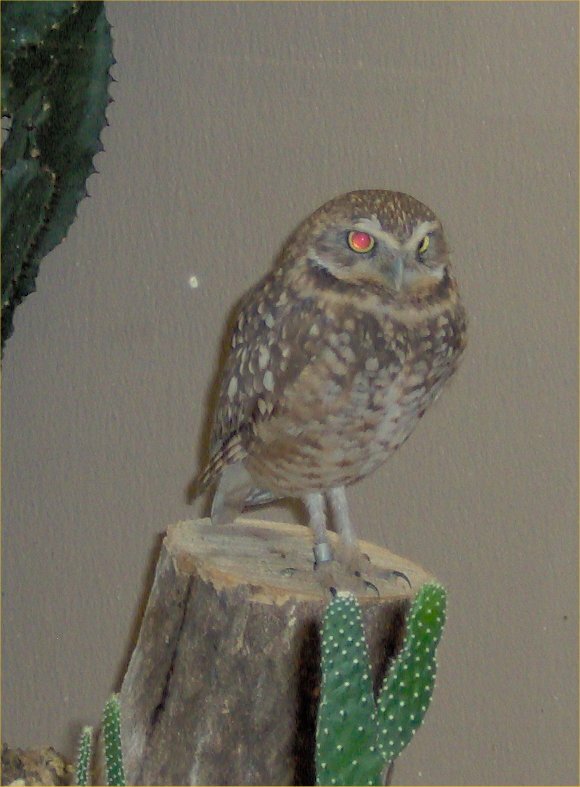 You can go to their web site for information and photos of most of their animals as well as many videos. 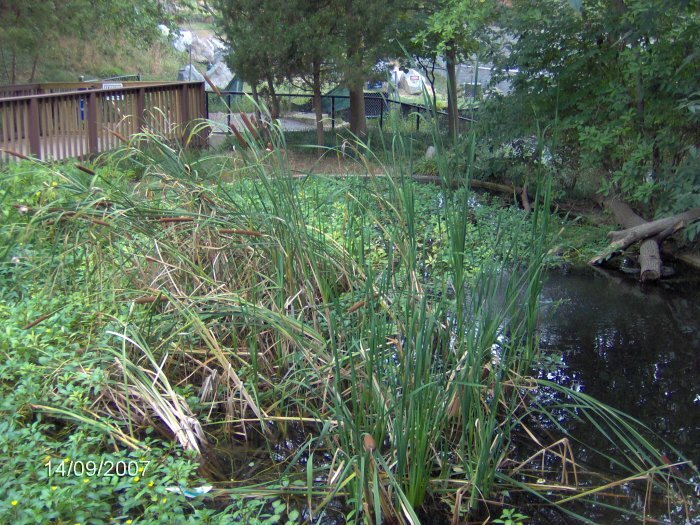 After the zoo, we went to Clyde's restaurant, and I took photos of the pond there which you can see here. 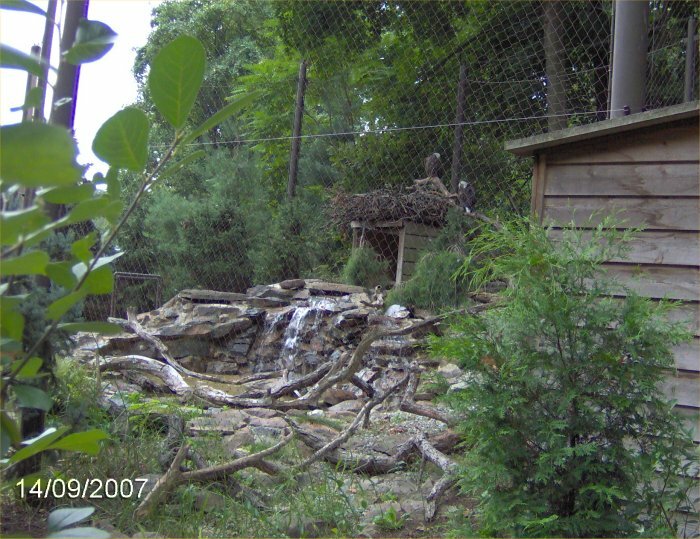 You can also see photos from the Maryland Zoo that I took on 6/7/06 here. 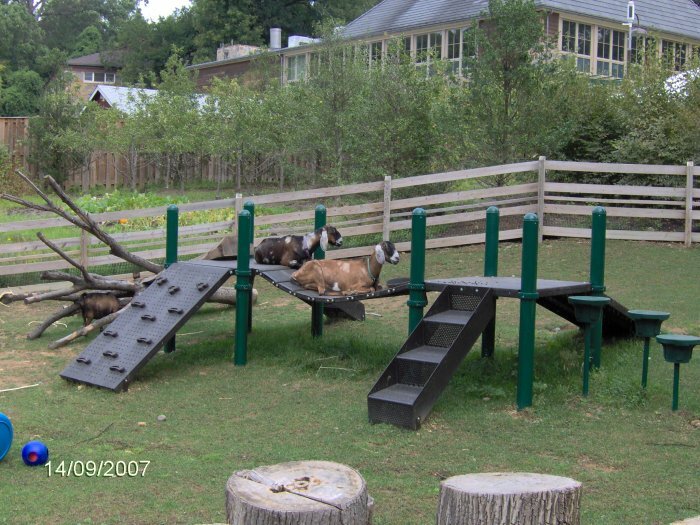 There are photos from the Catoctin Zoo on 11/9/07 here.